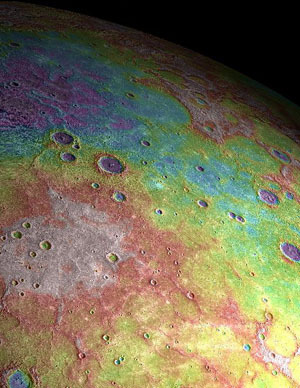 There is more to Mercury than scientists previously thought. MESSENGER, the first ever probe to enter orbit around Mercury, has collected more than four million measurements of Mercury’s surface and the findings show compelling evidence for unusual dynamics within the planet, indicating that Mercury was not a dead planet throughout most of its evolution. New observations from a spacecraft orbiting Mercury have revealed that the tiny, pockmarked planet harbors a highly unusual interior — and the craft’s glimpse of Mercury’s surface topography suggests the planet has had a very dynamic history. The observations were taken by a probe called MESSENGER (short for Mercury Surface, Space Environment, Geochemistry and Ranging), the first ever to enter orbit around Mercury. MESSENGER reached Mercury’s orbit in March 2011, and has since circled the planet twice a day, collecting nearly 100,000 images and more than four million measurements of Mercury’s surface. A team of scientists from institutions including MIT, the Carnegie Institution of Washington, Johns Hopkins University’s Applied Physics Laboratory and NASA’s Goddard Space Flight Center have analyzed the data and precisely mapped the planet’s topography and gravitational fields. From the gravity estimates, the team found that Mercury likely has a highly unusual interior structure — an exceptionally large iron core overlain by a solid layer of iron sulfide and a thin outer shell of silicate mantle and crust. From topographic measurements, the team mapped out a large number of craters on the planet’s surface, making a surprising finding: Many of these have tilted over time, suggesting that processes within the planet have deformed the terrain after the craters formed. The researchers detail their findings in two papers published this week in the journal Science. Getting into orbit about Mercury was no easy feat, mostly because of its proximity to the sun. Any spacecraft heading toward the planet speeds up, drawn in by the sun’s powerful gravitational field. To counteract the sun’s pull and slow MESSENGER down, the MESSENGER team programmed the probe to fly by Venus twice, and Mercury three times, before slowing down enough to be captured in Mercury’s orbit with the help of a main engine burn. After entering Mercury’s orbit, the spacecraft began measuring the planet’s surface elevations via laser altimetry. Through radio tracking, the probe estimated the planet’s gravity field. Throughout the one-year mission, the MESSENGER spacecraft battled tides from the sun, which tugged the probe out of its optimal orbit, as well as what Zuber calls “sunlight pressure” — photons or packets of light from the sun that exerted pressure on the spacecraft. The team periodically adjusted the probe’s orbit and made precise corrections to its measurements to account for the sun’s effects, mapping out the gravity field as well as the elevation of the surface of Mercury’s northern hemisphere. The team’s measurements revealed surprising findings both in the planet’s interior and on its surface. From the probe’s gravity estimates, the group inferred that Mercury likely has a huge iron core comprising approximately 85 percent of the planet’s radius. (Earth’s core, by comparison, is about half the planet’s radius in size.) This means that Mercury’s mantle and crust occupy only the outer 15 percent or so of the planet’s radius — about as thin as the peel on an orange, Zuber says. The researchers also reasoned, given Mercury’s gravity field, that just above the outer molten layer of the planet’s core may be a solid layer of iron and sulfur — a type of layered structure not known to exist on any other planet. Co-author Dave Smith, a research scientist in MIT’s Department of Earth, Atmospheric and Planetary Sciences, says the scientific process that led to the team’s results was a journey in itself. Through laser measurements of the planet’s surface, researchers mapped out multiple geologic features in Mercury’s northern hemisphere, finding the range of elevations to be smaller than that of Mars or the moon. They also observed something unexpected in Mercury’s Caloris basin, the largest impact feature on Mercury: Portions of the floor of the crater actually stand higher than its rim, suggesting that forces within the interior pushed the crater up after the initial impact that created it. Zuber and her team also identified an area of lowlands approximately centered on Mercury’s north pole that could conceivably have migrated there over the course of the planet’s evolution. Zuber explains that a process called polar wander can cause geological features to shift around on a planet’s surface due to the redistribution of mass on or within a planet by geodynamical processes. One such process of transporting mass in a planet’s interior is convection within the mantle. Viscous material within the mantle circulates and can push fragments of crust up and out, shifting terrain around the globe. Given Mercury’s extremely thin mantle, as revealed by MESSENGER, Zuber says it’s challenging to understand how convection operated to raise broad expanses of terrain to the elevations observed. Be the first to comment on "MESSENGER Reveals New Data about Mercury"